Posted: 13 Apr 2019 06:54 AM PDT TARN TARAN SAHIB, Punjab—The peaceful sit-in-strike of Sikh leader S. Karam Singh Bhoian seeking action against the demolishers of historic Darshani Deodi of Gurdwara Sri Tarn Taran Sahib today completed 13 days. 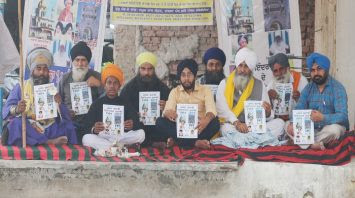 Although the mass support to his struggle is intensifying day by day, but the Administration has still not depicted any positive sign to indict the SGPC officials and the Kaar Sewa sect men.Speaking to Sikh24, Karam Singh Bhoian said that the administration is not depicting any positive attitude towards the demand of Sikh masses to indict the demolishers of the historic Darshani Deodi (Entrance gate) of Gurdwara Sri Tarn Taran Sahib. “I shall continue my peaceful struggle until all the SGPC officials and the Kaar Sewa sect men indulged in demolishing this historic Darshani Deodi are not booked under criminal charges,” he added. 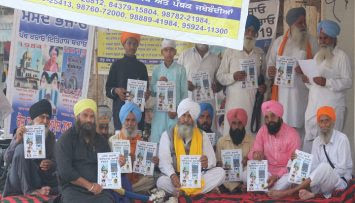 Mukhtar Singh, Sukhraj Singh, Harkirat Singh, Bibi Harinder Kaur Khalsa, Resham Singh Tarn Taran, Amrik Singh Nangal, Rajan Singh Chhina, Rajinder Singh Fauji, Amarjit Singh Kadeempur, Jagdeep Singh Hyderabad, Daljit Singh Jainpur, Suba Singh, Balwinder Singh, Mohinder Singh, Ranjit Singh Thind, Harpreet Singh Gill, Jagroop Singh Gill etc. were present on this occasion.